The stakes have never been higher, nor the competition and challenges more formidable in the arena of global business and politics. Economics may be largely unconstrained by geographic boundaries, with capital flowing freely across global markets, yet national political dynamics remain significant. As evidence, one need only survey the turmoil currently rocking parts of the Middle East and Central Asia. Or ask Kellogg School alumni Anwar Ul-Haq Ahady ' 83 and Ali Babacan '92, who are using their leadership skills to spur economic prosperity in their respective homelands of Afghanistan and Turkey. Yet his principal defense has been his education. "My [Kellogg] MBA has helped me a lot in managing the Central Bank, but I also learned critical thinking from my PhD studies [in political science at Northwestern University], says Ahady. Babacan too is leveraging his Kellogg School leadership insights as minister of state for the economy of Turkey. Though Turkey's business climate is radically different from that of Afghanistan, religious and economic concerns do rub shoulders as the country continues to enhance its productivity and bolster its financial infrastructure. "The multidimensional economic program that Turkey is implementing has overarching goals to introduce sustainable growth in the country. The main philosophy of this reform program is to create an open market economy under the rule of law," says Babacan. Turkey is undergoing a process of fundamental transformation, he adds, with its business relations and economic transactions "on a new dynamic path. Equal to, if not more important than, the economic reforms, are the political reforms toward full integration with the European Union," he says. Another Kellogg alum has embarked on a less tumultuous yet equally daunting task: rebranding an entire country. 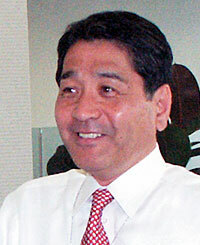 Somkid Jatusripitak '84 is Thailand's minister of finance. He says the insights gleaned during his time in the Kellogg PhD program play a major part in his marketing strategy for "revitalizing the economy of Thailand." "The concepts of marketing form the philosophy I use to drive government policy," says Jatusripitak, who is also working closely with Kellogg School Dean Dipak C. Jain, an adviser on foreign affairs to the prime minister of Thailand. "The 'Grand Strategy' I am now building is the strategic roadmap we have used to illustrate the applications of marketing—to tackle economic crises—and regain stakeholders' confidence." The heart of the Grand Strategy, says Jatusripitak, involves "repositioning Thailand by enhancing its competitive position in the global market," including restoring external confidence among regional players such as Indonesia and the Philippines, but also attracting other international investments. "Repositioning is about managing perception," says Jatusripitak. "By investing in Thailand, investors can set production here and market to all of Indochina. In addition, goods manufactured in Thailand can be exported to India and China— So we are positioning Thailand as another gateway to Asia." While leaders such as Jatusripitak are making bold moves, they are doing so in an environment that tests their management and innovation skills every day. Threats of global terrorism continue complicating business and life for millions. The dynamics of global commerce keep stretching supply chains, offering both advantages and logistical puzzles. And what began years ago as the migration of manufacturing jobs from the United States to countries whose regulatory environment proved attractive for firms, has also become a threat for thousands of well-paid U.S. software designers and other high-tech workers. "There are a host of strategic and logistical hurdles facing top corporate executives and senior government administrators," says Dean Jain. "Security, supply chain and branding, for instance, are only some of the areas requiring special insights. These are interesting, exciting times that hold much promise but also considerable risk for those unprepared to meet the customer needs of the global market. In our view, the leadership training that Kellogg delivers is indispensable for navigating the current economic and political climate." Among many examples of Kellogg students exercising their leadership at the intersection of business and politics is a project called Americans Supporting Iraqi Students. Several Kellogg students, in conjunction with the Kellogg Center for Business, Government and Society, have founded AMSIS to raise $1 million to help rebuild Iraqi schools. Iraq and many other strategic concerns were a major topic at the January World Economic Forum (WEF) in Davos. Ranjay Gulati, the Michael Ludwig Nemmers Distinguished Professor of Strategy and Organizations at the Kellogg School, attended and says the WEF's agenda suggests how complex the nexus of business and government has become. The framework for WEF this year involved seven threads, including topics such as ensuring global security, promoting global growth, managing new risks and spurring innovation. Poverty alleviation that creates jobs, not just takes the form of fund distribution, was also a central concern for the WEF this year --- hardly surprising considering the controversy that continues dogging advocates of globalization. Critics hold globalization accountable for many ills today, such as the inequality of wealth, exploitation of workers and environmental deterioration, says Pat Ward '80, managing director at Goldman Sachs International. Millions of people are "deeply concerned about the speed and scope" of globalization, Ward says. "This does not make them anti-capitalists, because many of their concerns are important." But Ward believes globalization is a "force for good" despite the challenges the model brings. "I am not saying the process of building a global economy is painless," he says. "More competition is never painless, and in many ways globalization is simply competition writ large. Old skills can become worthless overnight, traditional markets can be lost and tested management techniques can become obsolete." Nonetheless, Ward shares the position of globalization advocates who say the model is a liberating force that has brought immense benefits to some of the world's neediest people. Regardless of the ultimate merits of globalization, the realities of today's international marketplace are driving many firms to look beyond their home countries for competitive advantage, producing novel opportunities for leaders capable of managing the implicit challenges. Cesar Purisima '83, secretary of the department of trade and industry for the Republic of the Philippines, recalls "entering Kellogg as an accountant." When he graduated, he says, he had become "a manager of people and resources, enriched with concepts and wisdom that continue to guide me in my various leadership positions." These qualities are playing a major role in his efforts to craft an export strategy and build a policy and regulatory environment conducive to investment in the Philippines. He says that his department's strategies are based on the country's competitive advantages: "The Philippines is the third-largest English-speaking country in the world after the United States and the United Kingdom. It is also blessed with abundant natural resources," says Purisima. He believes key sectors that serve as economic strengths for the Philippines include electronics, which accounts for two-thirds of Philippine exports, as well as a competitive IT services industry and a significant mining industry. 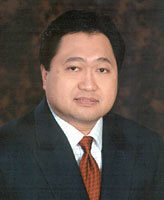 And like Thailand, the Philippines offers cargo and delivery firms what Purisima calls an "ideal gateway" to Asia. Perhaps most compelling is what he calls the nation's "medical tourism and retirement services" sector. "Our medical facilities meet world standards, yet are competitively priced," says Purisima. "We will soon fling our doors wide open to welcome tourists looking for top-rate medical services and reasonable terms." Asia continues to attract a lot of attention from disparate businesses. With enormous potential markets, countries such as China lure firms to their shores. But China also demands patience from prospective business partners. UPS, for instance, though operating in China, is "still not allowed to have its own entity there," says Ed Buckley '90, vice president of brand management and customer communications for the firm. "In China, we currently must work with a partner, and ours is a state-controlled firm that has partially privatized," explains Buckley. "What's fascinating is that this same company was selected to be the partner for other carriers too." Understanding and abiding by the often unfamiliar, even counterintuitive, regulatory demands of another country is simply one of the keys to doing business in multiple markets, says Buckley, who adds that by the end of 2005 UPS will be eligible to operate its own business in China. "It can be hard to absorb all these unusual circumstances," he says. "Frankly, there are lots of reasons why they don't make sense, but to succeed in relationship building and building your presence in a market you can't let the rules bother you." Alex Roth agrees that understanding the dynamics of a particular market is essential for a firm's global expansion to work. The 1996 Kellogg School alum and partner at The Monitor Group says that "there are certain unique elements to servicing one geography over another." Citing one instance, Roth notes that for a strategic consultancy to be successful in Germany, which has one of the largest consulting markets in the world, "you have to have a meaningful German delivery capability." For reasons that include language and work habits, "you cannot service Germany out of London," says Roth, although "you can service the Nordics out of London." Roth's observation raises a central consideration for firms operating in multiple countries: to what extent are local solutions required versus a regional or global overlay? These decisions have a significant impact on the product, supply chain and brand management. For example, Peter Tan '83, president and CEO of McDonald's Hong Kong, says that his company's approach to global growth involves "ensuring the brand's core elements are preserved—while still incorporating elements of the local market culture, such as food and ambience." As a result, McDonald's does not serve pork in Singapore, so that Muslims can enjoy the company's food. In India, both pork and beef are removed from the menu, replaced with the "Maharaja Mac," a vegetarian version of the Big Mac. 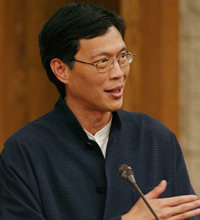 Tan says that globalization should not be "the imposition of American culture" on the rest of the world. "Our brand and heritage is as American as it gets, yet we do not think of ourselves as an American company," he explains. Digital communications continues to propel the nanosecond culture, says Tan. As a consequence, business, political and cultural models are forced to change at an unprecedented rate. 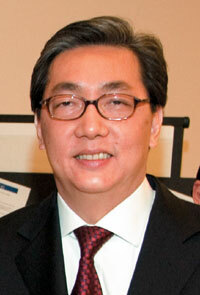 "For businesses, the choice of competing locally or globally is fast disappearing," Tan says. "Whether in production or as a marketer, the need to become the lowest-cost provider, as well as being quick to market, requires businesses to think globally." Pressure to expand, even in a demanding market environment, requires strategic innovations, such as alliances and product extensions. At the same time, retaining control of the brand is essential. For leaders such as Yoichiro Furuse '70, executive vice president and CFO of Sanyo Electronic Co., growth includes identifying and entering new businesses. He says that Sanyo is eager to enter both the automobile and housing industries, leveraging its strengths through strategic alliances that will enable the firm to bring its expertise in electronics to develop cars equipped with information technologies and cutting-edge batteries to develop attractive electric cars. "Likewise, we can use our technologies, such as home network security systems, to assure comfort and safety of people's living spaces," says Furuse, who credits his Kellogg School education --- including the "servant leader" model advocated by the late Professor Robert Neuschel --- as instrumental in his management approach. Furuse also sees a "mountain of opportunities" for his firm among the aging population, citing figures by Japan Life Insurance that indicate some 15.6 percent of the world's population by 2050 will be over the age of 65. Entering new businesses is something that UPS has already done, says Buckley. As it has done so, however, a corollary challenge for the firm has been to communicate its expertise and presence to customers, something that requires different strategies depending on the context. For instance, he says, "Most people in the United States don't realize that while we have this enormous ground network of trucks, we are also the 11th largest airline in the world." Similarly, he notes that UPS also has "a pretty robust financial services business" and has expanded beyond small package delivery into overall supply chain management services. Yet, in the United States at least, Buckley says UPS has had to extend its brand "a little more slowly and methodically" than in other locales, since many Americans still primarily identify the firm as a trucking company. Geographic expansion and new businesses are only two of the growth options, says Roth, who believes that marketing and innovation are also key. For Roth, successful growth includes the human resources capabilities of the firm. "It's my belief that the human resources manager must be a critical component of the strategy team," he says. Because of the complexities of global competition, firms must increasingly be focused on determining the appropriate skills and competencies required within the organization at a given time. Yoshi Inaba '76, CEO and director of Toyota Motor Sales California, says human resources are becoming "the major constraint" on the firm's globalization strategy, impacting everything from product development, production set up, and sales and marketing. "The only way to meet these demands is to make the best use of our local human resources in each market Toyota does business and to make them bona fide Toyota team members," says Inaba. For graduates such as Inaba and Wayne P. Borduin '02, senior finance adviser at ChevronTexaco, their Kellogg experience has enabled them to develop communications and leadership skills essential for today's global marketplace. "Kellogg's group study method helped me a lot by providing a perfect way to develop an attitude of listening to what others have to say, and learning to interact with those who hold different opinions and value systems," says Inaba. Borduin agrees: "As evidenced by its collaborative culture, the diversity of the student body, its high ethical standards and overall responsiveness to change, Kellogg is the fertile ground for breeding tomorrow's global business leaders." It's the skills honed at Kellogg that will continue to enable its alumni leaders to make a difference on the world stage --- while addressing the challenges of globalization. "Although I do not have misgivings about globalization, the leadership of nations needs to do more to fill the gap between the wealthy and the poor," says Furuse. "Suppressing the voices of the market will not bring a constructive solution—but at the same time, governments and corporations must work together to protect the environment—and improve the living standard that brings hope for the whole population." 1 On extended leave from his role as a professor of political science at Providence College in Rhode Island, Ahady was unavailable for an interview given the demands of his current responsibilities. However, he did speak with Northwestern Magazine last fall in an article written by Katherine Leal Unmuth, from which these details come.